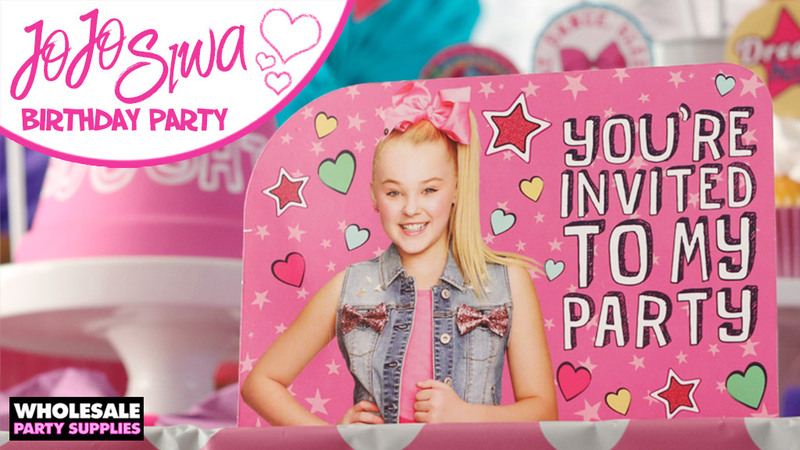 If your tween girl is currently obsessed with Youtube, hair bows and dancing she’s probably a fan of JoJo Siwa. This fun loving, positive role model is a great inspiration for this year’s birthday party for your rockstar in training! You might remember her from the TV show Dance Moms, but she has become an ambitious entrepreneur since then. If you haven’t noticed her growing stakehold over the hearts of young tween girls, then get ready. Her positive message is going viral and we are here for it! We brought in all the JoJo Siwa party supplies and JoJo Siwa costumes, and they are flying off the shelves! Take a cue from JoJo’s “Guide to the Sweet Life” and throw a party that’s shows all the ways to be you with your own style. Bring in hints of JoJo’s signature bows when it comes to food and party décor and leave everyone happy to celebrate a fun friend! This post was written, styled and shot by Tara at Spot of Tea Designs. Check her blog out where she’s been posting about a drama-free life since way before Dance Moms! If you keep a lot of friends because you’re loyal, act like JoJo and treat them real nice like they’re royal! 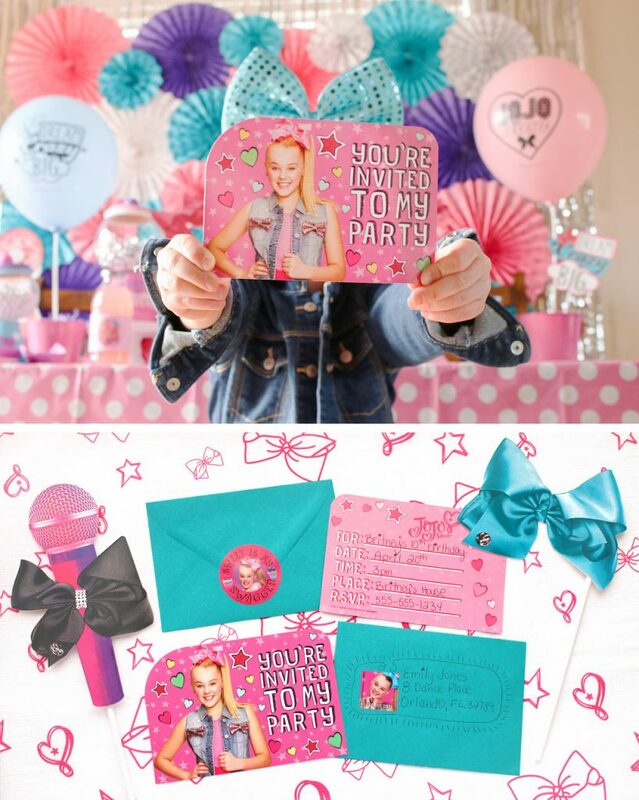 Send them a JoJo themed invitation letting them know the party details and cross your fingers they get the hint to rock their hairbows on your special day. 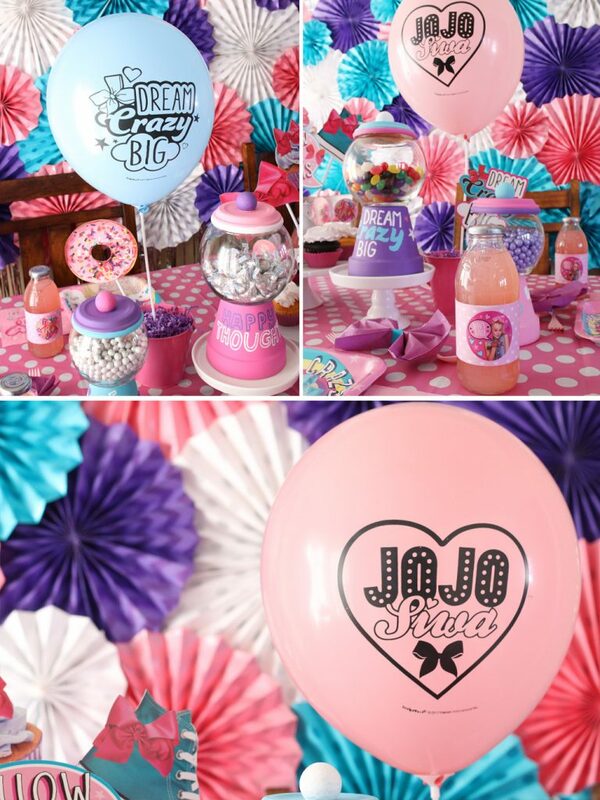 Encourage girls to dream crazy big with JoJo’s positive messages all around! Dress the table with JoJo’s line of plates and coordinating tableware and blow up some balloons sharing these messages in your party space. Tip: If you’re all out of helium, use balloon sticks to get the message across with this high flying party décor! Don’t skimp on JoJo’s signature look, a bow! 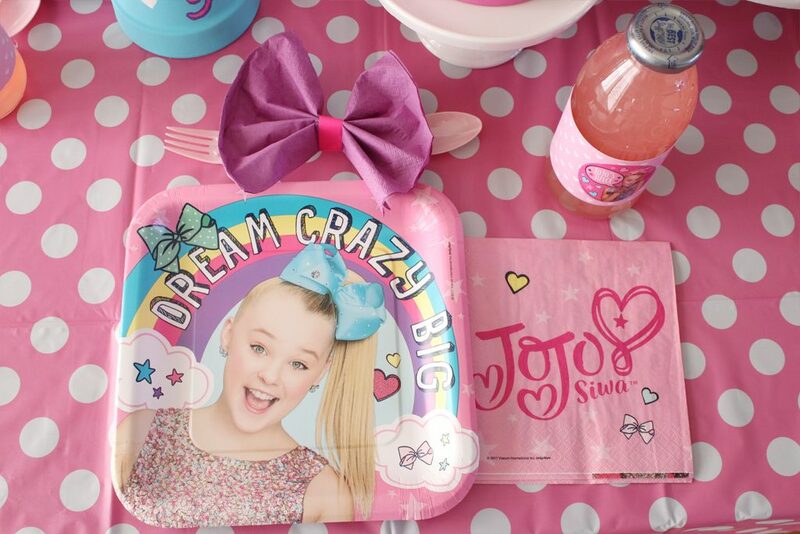 Turn your napkins into them to hold your utensils, add them to decorative elements and if friends forgot to wear theirs, have extras on hand to get the in the JoJo Siwa spirit! And don’t forget to add texture to your party space with a color coordinating paper fan backdrop! Tip: if you don’t have a blank wall, tape together pieces of foam core so you can hot glue colorful paper fans on top of this temporary surface. 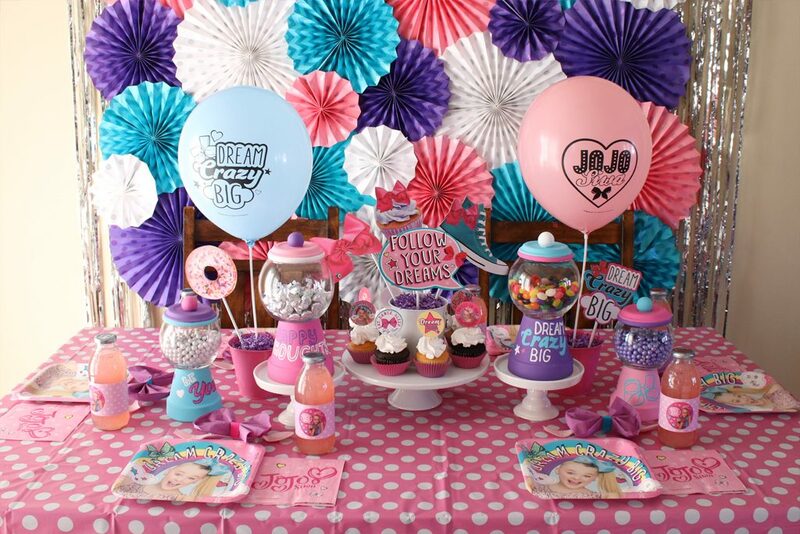 JoJo says life is sweet and your party can be too! 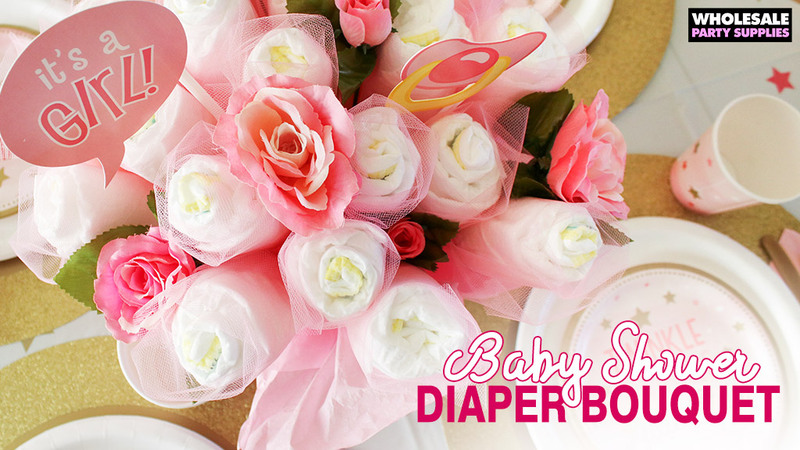 Friends will feel like a candy queen when they enter the party space with sugar all around! 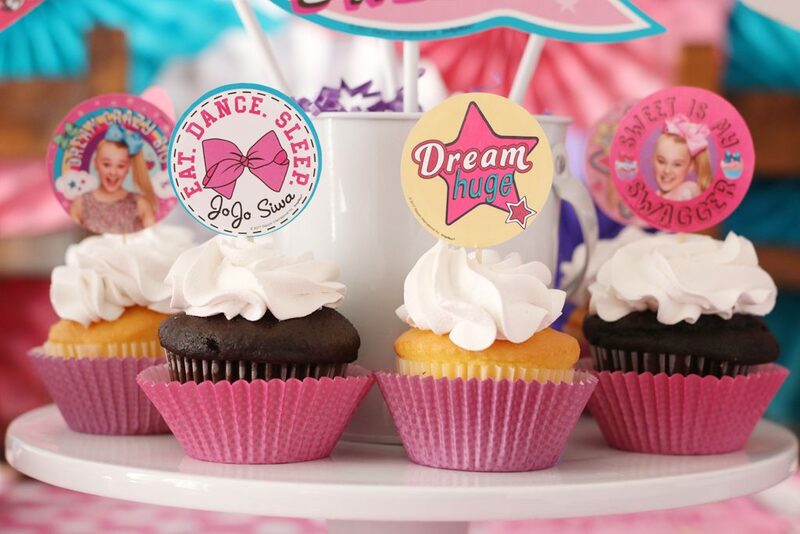 Stage cupcakes (bonus points if they’re Funfetti) on the table with stickers turned cupcake toppers as a centerpiece. Tip: this easy DIY topper can be added to any platter of sandwiches or even bowtie pasta! Line the center of the table with DIY candy dishes filled with an assortment of candy treats to be enjoyed between activities. 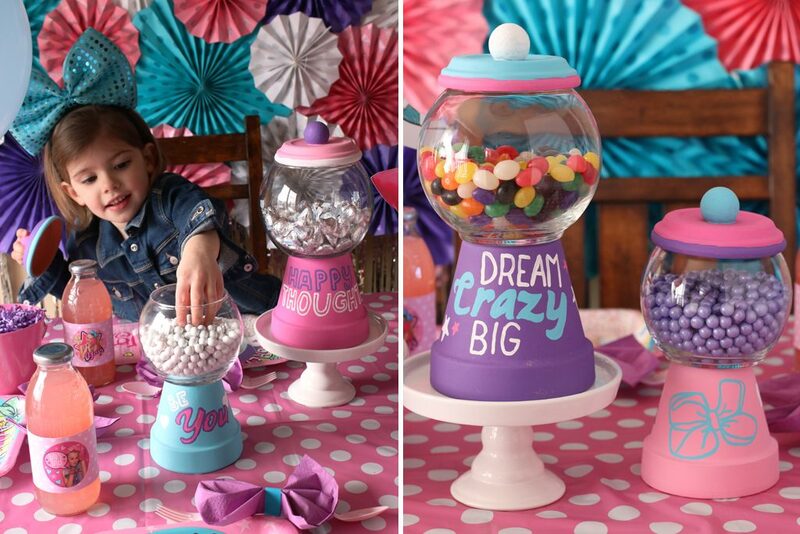 Add candy into all different sized glassware or make your own custom one that matches the theme! 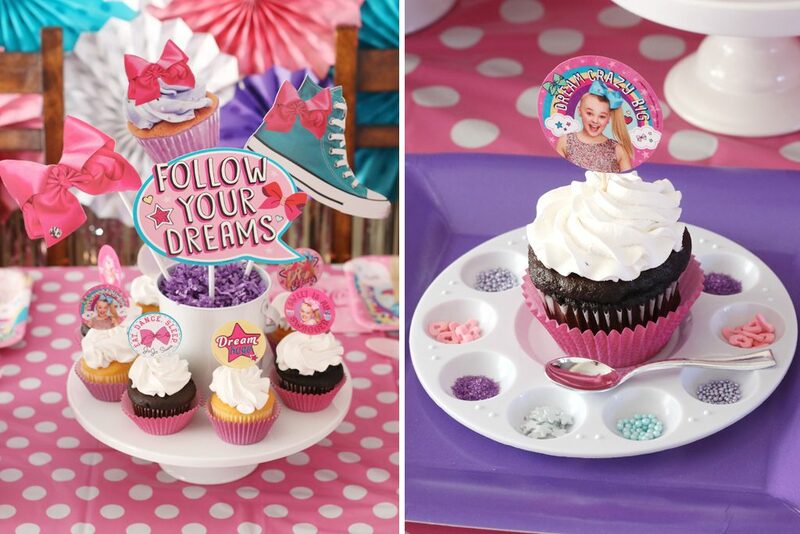 Learn how to make these unique candy dishes using terra cotta paints that you can paint to match any theme, including a JoJo Siwa party! 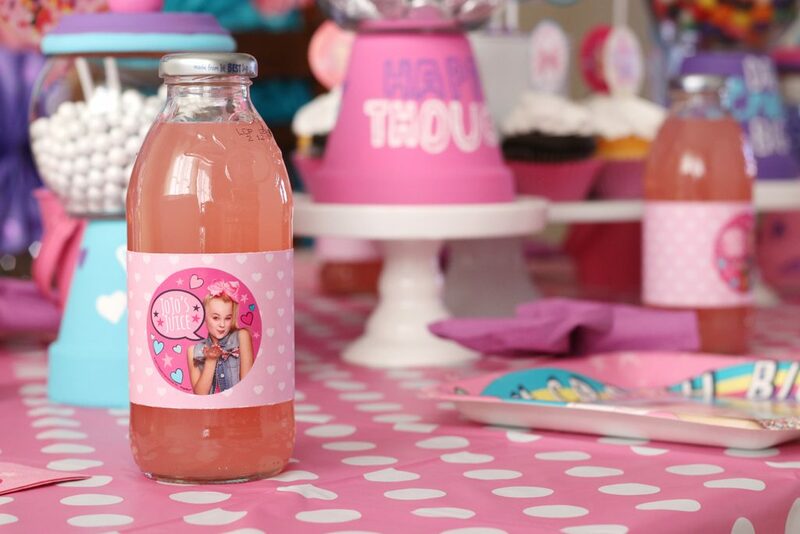 If guests are thirsty at this party they can always grab some of JoJo’s Juice! Just make sure they sip it with a straw and don’t dump it over your head like JoJo! Tip: peel off the drink labels and repeat use of those stickers as drink wrappers! 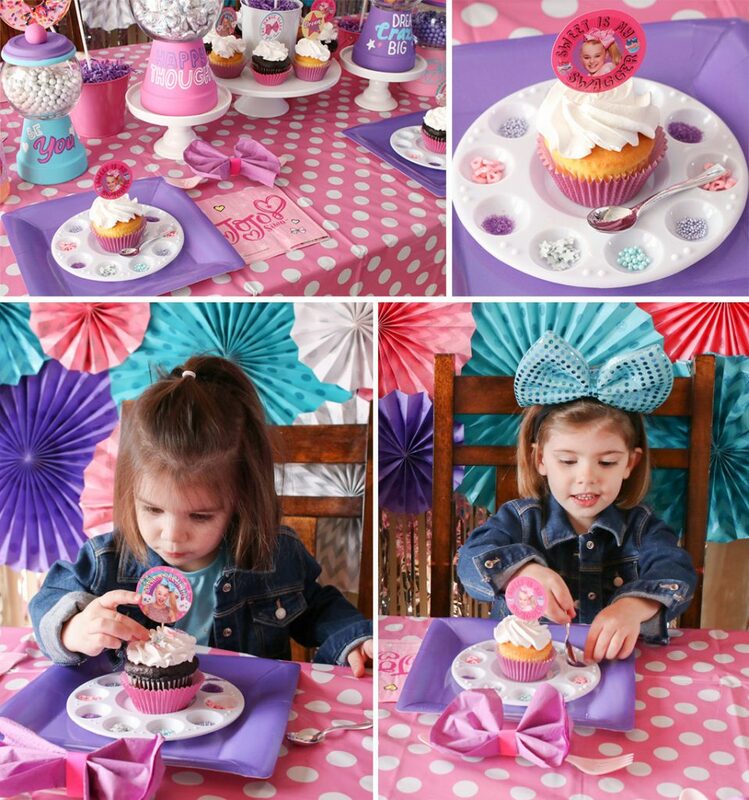 Skip the standard party cake full of tasteless fondant decorations and let everyone show off their own style with a fun cupcake decorating activity! Set up each cupcake as a blank canvas on a clean artist palette and fill each spot with some colored sugars, sprinkles and decorative accessories. After consuming their sugary creations, if you hear your friends stand up and yell “I just wanna dance” you know it’s time to hold a dance party and rock to JoJo’s hits! Make sure everyone has the chance to shine and have plenty of microphone props handy! When everyone’s all sugared up and danced out, it’s time to bid them farewell. 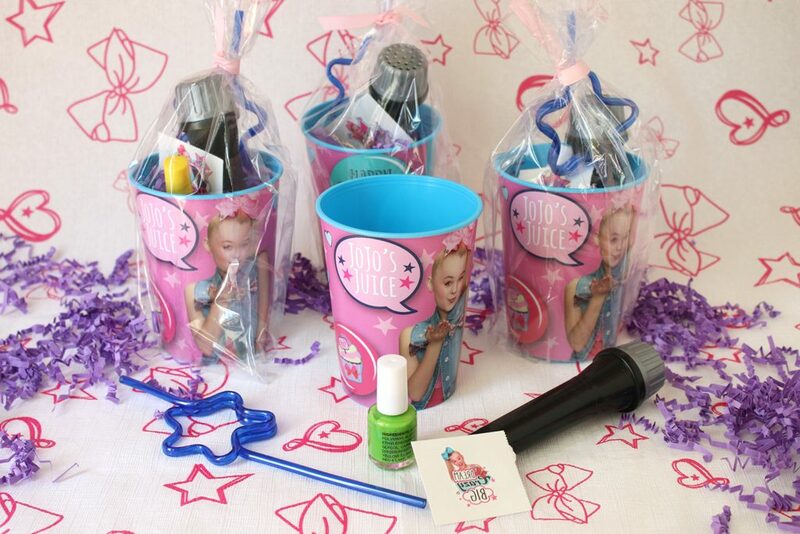 Place a fun collection of party goodies like nail polish, JoJo Tattoos, a star straw and lip gloss in a JoJo favor cup and wrap it up in a clear cellophane bag to get them home safely.